← HURRAY! Blog is back! I try to get handmade cards sent to all my friends and relatives, but admit to resorting to a quick comment on social media from time-to-time! So, this extra inspiration is just the boost I need to get those cards sent! There will even be a stamp with this hashtag available on March 7th. 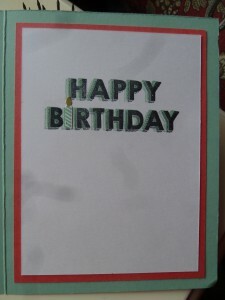 The double stamping on the sentiments on this card was fun. I stamped in Mint Macaroon and then moved the sentiment slightly and restamped in black. Added a lot of depth that I really like! Come join the Facebook page…great inspiration! 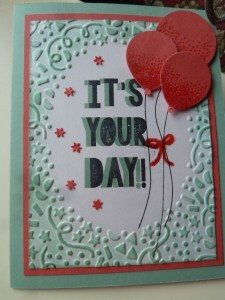 This entry was posted in SU Only and tagged Balloon Bouquet Punch; Confetti Embossing Folder, Party Wishes; Party Punch Pack; Party with Cake; Balloon Celebration. Bookmark the permalink. Kaye, that’s a fabulous card! I love it.